The AyurYog project “Medicine, Immortality, Moksha: Entangled Histories of Yoga, Ayurveda and Alchemy in South Asia”, led by Dagmar Wujastyk, examines the links between the three disciplines of Yoga, Ayurveda, and alchemy with a particular focus on notions of longevity, rejuvenation and immortality. “The Haṭhayoga Project” led by James Mallinson at SOAS, aims at establishing a history of Haṭhayoga, mostly by producing critical editions and annotated translations of little known Sanskrit texts. Two years, approximately, after the launching of these projects, I would like to draw attention to some extra-textual experiments carried out in the framework of both projects. In October 2015, the AyurYog team visited the UK to meet with Andrew Mason for an introduction to traditional Indian iatrochemical practices. Andrew is the author of Rasa Shastra: The Hidden Art of Medical Alchemy and an experienced practitioner of Indian alchemy and iatrochemistry (rasaśāstra) trained in Sri Lanka and in the UK. Dagmar Wujastyk, Suzanne Newcombe and I settled for a few days in the countryside of Dorchester (Dorset). 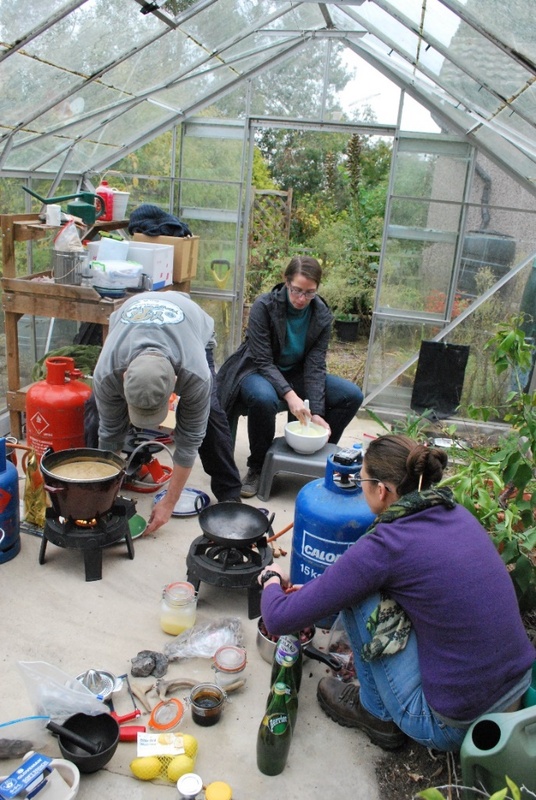 In a garden shed (in the event of rain), Andrew Mason demonstrated and allowed us to participate in the purification process of substances as diverse as iron, zinc, pearls and deer horn, all of which enter into the composition of rasāyana recipes in ancient medicine and alchemy texts. In the image above, you can see Dagmar grinding sulphur (gandhaka) in a mortar, while Suzanne places rose petals in a bowl for the preparation of an elixir (rasāyana) made of pearls and rosewater and Andrew watches the cooking of a concoction of the three myrobalans (triphala) that has been heated and reduced for about two hours. Surprisingly, Andrew had all the ingredients and tools needed to implement these recipes, some of which date back two millennia to the medical treatise Carakasaṃhitā. The materials included dried cow dung from local British cows, which was used to roast ingredients such as deer horn or iron pills at a high temperature (ca 850℃) in a baking pit Andrew dug in the garden. You can see below the dry British cow dung, very similar to that of Indian cows, and the pit the ingredients were roasted in. The observation and to some extent the involvement in the preparation of recipes for the preparation of various substances following the ancient prescriptions of medicine and alchemy has enriched, and certainly made more careful my reading of the corresponding texts. In particular, the importance of two theoretical points was demonstrated by this experiment. 1) There is no measurement of time for the preparation of these recipes. The early ayurvedic and alchemical texts never indicate the duration of cooking, etc. Rather, the successful completion of the transformation of ingredients from one state to another – from liquid to solid, from compact matter to powder – is determined by the experienced practitioner through the sense organs by smell, touch, sound, sight, and taste. 2) The purification processes are repeated several times, and this circularity of recipe sequences, though crucial to the preparation of formulae, is most of the time imperceptible in the texts. 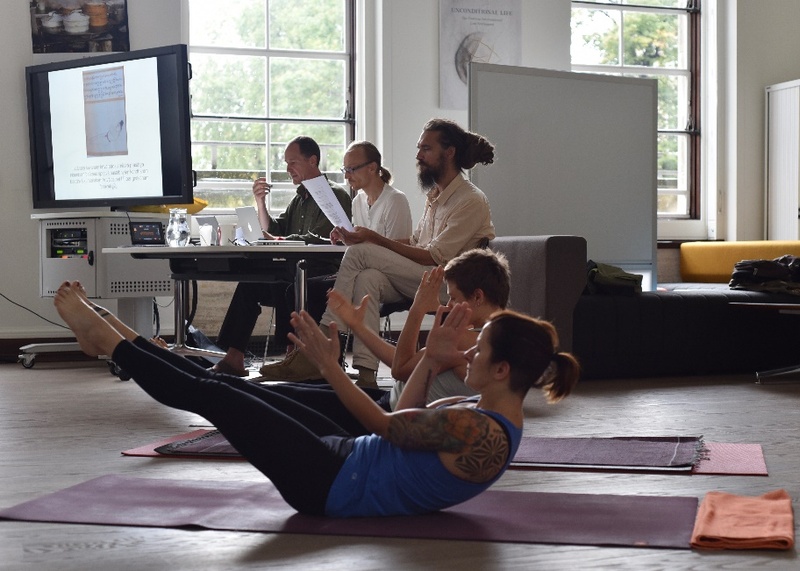 The last session of the workshop “Sanskrit texts on Yoga: a manuscript workshop” (see here for a film of the workshop) organized by The Haṭha Yoga Project in September 2016 is another recent example of experiment in the context of textual studies. It was devoted to the reading of a passage on āsanas, “postures”, in the Haṭhābhyāsapaddhati, a “Manual on Haṭhayoga” composed in the seventeenth century. During this fascinating three-hour session, the reading and translation of the Sanskrit text was accompanied by the projection of corresponding images of āsanas included in the Śritattvanidhi, a treatise dating from the nineteenth century. For example, the picture below is a representation of the hatchet posture (paraśvadhāsanam), along with the Sanskrit text (in kannaḍa script). "[The yogin should] lie supinely, place both elbows on the navel, extend one hand at a time and hold the nose by the thumb, with the gaze on it, while supporting [the position] with the region of hips. [He] should remain [thus. This] is the hatchet pose." 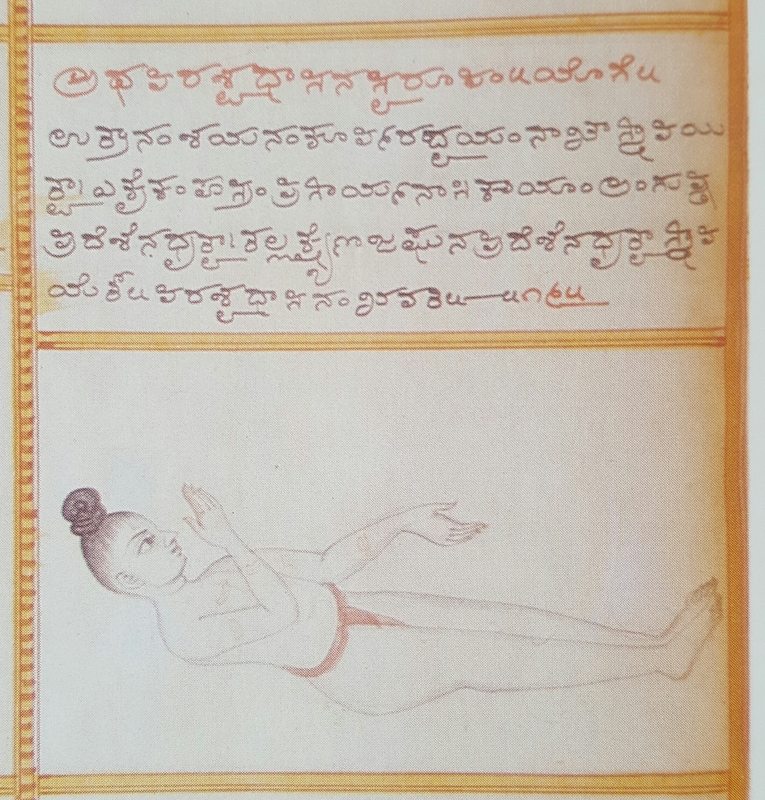 While the Sanskrit text of the Haṭhābhyāsapaddhati was read, and this picture was projected on a screen, two proficient yoga practitioners were implementing and interpreting the text by performing the postures described. In the picture below, you can see the whole arrangement of this reading session: At the back is the screen on which a pre-modern representation of the posture is projected, in the middle, the three Sanskritists, from the left, Mark Singleton, Jason Birch and James Mallinson, are reading the Sanskrit text and in the foreground, two advanced yoga practitioners perform the posture. The presence of practitioners may seem of little importance. On the contrary, the understanding of the description of complex postures in Sanskrit is almost impossible without watching someone doing them, or doing them oneself! I had already gone through the text before this reading session, but mere reading did not allow me to perceive the difficulty of the postures described, which certainly require in-depth training. (By the way, I would like to salute the high level of physical competence of Agi Gazda and Ruth Westoby, who are true athletes!). This special reading session reminded me of an experience I had with a Sanskrit text on mudrās, that is, “particular positions or intertwining of the fingers” in a ritual context: it was impossible to establish the critical edition of this chapter on mudrās without doing the mudrās! As Sanskritists, our research activity focuses mainly on the reading, analysis and editing of unedited texts, stuck as we are behind our computers. However, in order to understand certain texts, we sometimes resort to practices outside of the text, to intermediate fieldwork practices. These fringe philological experiments are particularly useful to deepen the knowledge of technical texts, which are specially concerned with what is called "tacit knowledge". Sensual knowledge and gestural knowledge are fully relevant for the study of Sanskrit medical and alchemical texts (rasaśāstra), as well as the study of Sanskrit texts dealing with yoga postures. They represent a valuable tool to approach the temporality of processes and priority level of actions that are especially difficult to determine in texts dealing with yoga, medicine, or ritual. The use of practical experimentation to support philological and historical research is explored at some length in Ambix, The Journal of the Society for the History of Alchemy and Chemistry, which provides a stimulating and in-depth presentation on the subject in its special issue entitled “From the Library to the Laboratory and Back Again: Experiment as a Tool for Historians of Science” (2016, 63.2). In the introduction, the editors Hjalmar Fors, Lawrence M. Principe and H. Otto Sibum give a very useful account of the background of this methodology, highlighting the great benefit of experiment in their field. They attach great value to sensual information, noting that “sights and colors, smells, sounds, feel, and taste all play an important role, particularly in fields relating to chemistry”. They assert the “complementary nature of reproductions and textual analysis”, a brilliant example of which is given by Sébastien Moureau and Nicolas Thomas in “Understanding Texts with the Help of Experimentation: The Example of Cupellation in Arabic Scientific Literature”. Through their experiment on cupellation, a technique used to purify gold and silver, the authors were able to confirm the meaning of a passage in a thirteenth-century Arabic text.